Cold War is a glorious throwback – a film made with a verve and lyricism which rekindles memories of the glory days of European New Wave cinema. Notable as one of the few films at Cannes Film Festival 2018 with any British involvement, this is a decades-spanning romantic drama that never loses its ironic edge. In telling a story reportedly inspired by the experiences of his own parents, Polish-British director Pawel Pawlikowski invokes memories of Milos Forman, Jiri Menzel and François Truffaut at the start of their careers. He shoots in black and white and recreates both post-war communist Poland and 1950s and 1960s Paris in meticulous detail. Any sense that the film is an exercise in sepia-tinted nostalgia is scotched by the wonderfully fiery and mercurial performance from Joanna Kulig. She plays Zula, a young woman from a provincial background who forces her way into a communist folk music troupe assembled for propaganda purposes in Poland in the late 1940s. Their songs (all of which seem to have ‘oy, oy, oy, oy’ as a chorus) are surprisingly catchy. Wiktor is one of the musical directors. He is a talented composer, toeing the line to keep in with the authorities but dreaming of exile and artistic freedom. He and Zula fall in love. Their relationship is combustible in the extreme. They can’t live without each other but, for much of the time, they can hardly bear to be in each other’s presence. Zula has a reputation for wildness. She once attacked her own father with a knife (to stop him mistaking her for his wife, she explains). In a drab, conformist society in which everybody snoops on everybody else, she has very obvious star quality. The folk troupe is successful and allowed to travel internationally. This eventually gives Wiktor the chance to defect westward. He re-invents himself as a bohemian jazz musician in Fifties Paris. 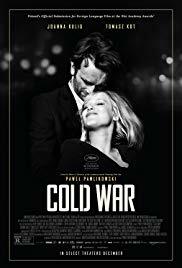 In the course of Cold War, Pawlikowski leaps from Poland in the late Forties to East Berlin a few years later; from Paris in the mid-1950s to Yugoslavia in the same period; back to Paris and eventually to Poland again. As the years pass, there are huge convulsions in the lives of the two lead characters. They have other relationships. When you think they will be at their happiest, together in Paris without the communist authorities breathing down their necks, they manage to make each other miserable. They both yearn for their homeland. As the years go by, Zula becomes a celebrated jazz singer and later even a minor pop star: a diva who brings a Piaf-like pathos and soulfulness to her performances. Wiktor endures brutal hardship. The same story could easily have been told as a Dr Zhivago-like epic about two lovers buffeted on the tides of Twentieth Century history. That’s not Pawlikowski’s style at all. The film never loses its intimate and playful quality. It takes its tone from Kulig’s performance. One moment, we will see her singing rustic folk songs in front of communist dignitaries. The next we will see her going wild, dancing to rock and roll for the first time. She is impulsive, jealous and sometimes malicious but she is also very loyal to Wiktor. In less than 90 minutes, we’re taken right through the main staging posts in the two lovers’ lives. Whatever they endure, whether separation, betrayal, alcoholism, the ravages of ageing or even imprisonment, they never give in to self-pity. Reflecting the two leads, the film retains a quiet humour throughout.